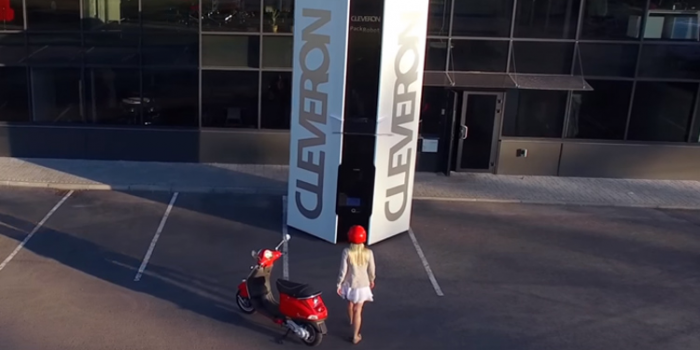 Last fall at GRAPH EXPO in Chicago, Bell and Howell announced a partnership with Cleveron, a postal technology company based in Estonia, to jumpstart parcel terminal delivery in North America. Last week, executives from both companies, along with the Prime Minister of the Republic of Estonia, the Honorable Taavi Rõivas, and a delegation of U.S. business leaders and public officials, unveiled the PackRobot intelligent locker at a special event at Bell and Howell’s headquarters in Durham, North Carolina. Bell and Howell will be showcasing PackRobot at the upcoming MODEX 2016 supply-chain tradeshow, April 4-7 in Atlanta. PackRobot is a new advance in intelligent systems for consumer delivery and pickup of parcels and packages. Built upon experiences gained from producing an initial line of first-generation smart lockers, Cleveron’s patent-pending innovation combines advanced Internet of Things technologies with modern consumer-friendly, space-efficient ergonomic design and aesthetics to bring the convenience of smart lockers to new environments.